(St. Charles, MO) – Many low income Missourians think they have no help available when they face financial challenges that lead to other problems. The eviction process is one example. In some situations, the help of a lawyer can be the difference between being allowed to stay in a home and having nowhere to call “home”. Lee Camp is an attorney with Legal Services of Eastern Missouri, one of the legal aid offices in the state. He provides details on some of the resources available to low income Missourians, why they are offered and the impact it has on everyone. Also, Kim Case has made the journey from victim of a violent crime to advocate for today’s victims. 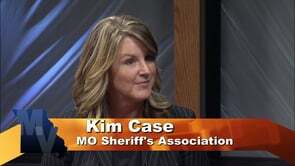 She’s part of the Missouri Sheriffs Association’s team of advocated for crime victims. She explains what they do, how it helps those affected by crime and why it’s an important part of the justice process in Missouri.